I’ve been getting a lot of interest (and traffic) due to the popularisation of Yanxi Palace. While I’m actually SO OVER the show, I have decided to be opportunistic about this and spread a bit more knowledge about the lesser known facts that’s not directly covered in the show through this series. Yes you heard it right, it’s a series, about 3-4 characters. As usual, finding men who are willing to dress up and take pictures proves to be the biggest pain point, so we would have to be contented with women for now. First up, have a look at this picture and point out what is the biggest issue with this, factually. I’ll come to that at the end of the article, and you guessed it–this is an article about Chinese Opera. There were some discussions by Chinese netizens of whether Gao Guifei/Lady Gao was singing along to a piece from Peking Opera or the Kunqu (Kun opera, one of China’s UNESCO intangible cultural heritage artform)–the distant predecessor of Peking Opera. To clear the air, it could not have been Peking Opera because it was only first introduced (or recorded so) during Emperor Qianlong era. To be precise, on his 80th birthday. Sharp viewers of the show would’ve recalled that Imperial Consort Gao was the first lead character to go offline in the show, so she could not possibly have lived till the 80th birthday of Emperor Qianlong, her lord *curtsey* to start learning Peking Opera, let alone perform it as a connoisseur. So it could have been Kun Opera, which was said to have started in the Ming dynasty some few hundred earlier. The research and production team of the show said it was Kun opera too, but there are actually 300 over different types of Chinese opera which sprung off from Kun opera. So there was a researcher who claimed that in real life, it could’ve been one variation called Qing Yang tune which was the in-between of Kun Opera and Peking Opera. While most would associate Yanxi Palace with the Manchurian wear of round collar or sometimes high-collar long one-piece robe that were mainly straight cut and had not much loose fabric, Gao Guifei is possibly the only person who appeared in Hanfu in the show. When the Manchurians defeated the Ming dynasty rulers of China, they also mandated that all the Han Chinese were to follow the Manchurian custom of dressing and hairstyle. That meant that all men would need to shave their head to a style that left them with nothing but a tiny area of hair behind their head and braid them up, and they had to wear the Manchurian robes which were actually kinda similar to the Tang dynasty round-collar robes. Cutting of hair was an extremely grave matter to the Han Chinese and there were bloodshed protests. Eventually, there was a concession that besides 10 unspoken (and not officially listed) categories of people, everyone else had to convert their dressing identity to Manchurian dress and hair. And the Han Chinese men had to choose between keeping their heads or keeping their hair. Kind of a no-brainer really. So besides women, performers who were acting as period characters (or cosplaying so to speak) were exempted from that. 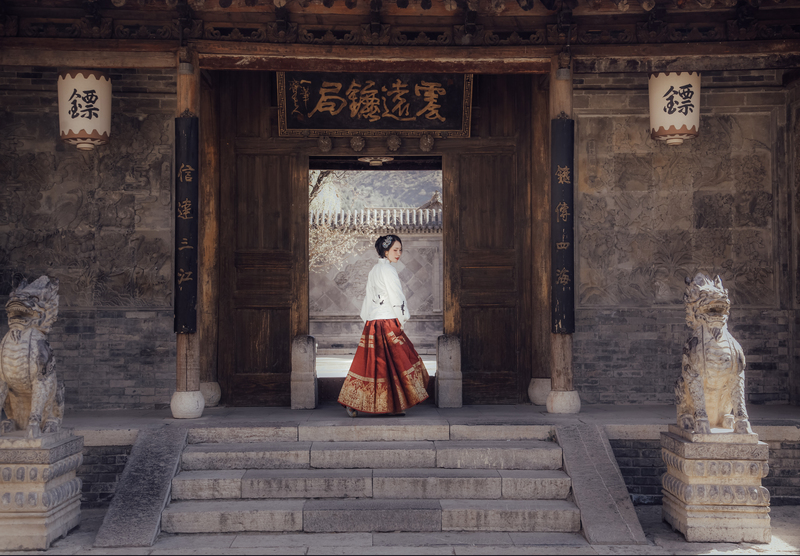 Therefore whenever people wore the really stereotypical type of Hanfu, the average Chinese folks would either think you’re going to act in a period show, or they think that you’re performing in a Chinese Opera piece. One of the more well-known pieces in Peking opera was the performance Drunken Concubine, which was originally from a Kunqu piece called The hundred-flower pavilion. Then in late Qing dynasty, a Peking opera performer called Mei Lanfang “repurposed” the original Kunqu piece to what is known as the Drunken Concubine piece in Peking opera. The story? The tragic love story between Lady Yang and Emperor Xuanzong in Tang dynasty. Perhaps there is a reason why it was chosen in the Yanxi show–to draw a parallel between the ill fate of Lady Yang and Lady Gao as two gorgeous women, doted on by the emperor for their artistic talent (singing, dancing) but died quite early in life for reasons beyond their control. In Yanxi Palace, Lady Gao wore a really elaborate headpiece that is somewhat more Peking opera than Kunqu opera. Kunqu opera is a lot more stylised and dainty in its headpieces, whereas the Peking opera is more opulent. Possibly also representative of the style and aesthetics of northern and southern China–Kunqu is southern, Peking is northern. Thus, I have taken the liberty of reimagining Lady Gao as a Kunqu performer in the story of Lady Yang, and wearing her iconic emerald green dress. Now that we’re done… remember the first picture I shared of Lady Gao in her Chinese Opera styling? Found the error? I took the liberty of Adjusting the original image a little bit to reflect a more accurately how she should have looked if she had the right make-up and hair. Essentially, for aesthetic reasons, clearly the producers decided to have a much more toned-down make-up for Lady Gao when she’s acting as the Kunqu performer in the show. Her curly fringe were also a lot higher on her forehead than what was originally supposed to be. I was fortunate to be talking to someone from Nam Hwa opera troupe the other day, and was told that the reason that they had all those fringe and sideburns was origianlly used to conceal and frame the face so the performer’s face would appear smaller. This is due to the fact that Chinese opera had been performed by men for the past many centuries, and in order to make themselves look more feminine, they had to use such features to conceal their masculine facial structures and shape. A fascinating piece of history isn’t it?! Why Gao Guifei to start the ball rolling? I have a friend who really likes Gao guifei, and I guess she is just so unpretentiously evil which on hindsight, makes her the nicest villain of all. When we were playing the sad music of Yanxi, and thinking of the ill fate of Lady Gao, we felt her sorrow… She was so young and beautiful. I actually think that the stylist in the show must’ve hated Lady Gao because her make-up and hair were really unflattering. That’s why this article covers the two styles that I found her most beautiful in. When I was doing the shoot with the model, I managed to find a very beautiful and cheery Lady Gao, and I found her really attractive! I could imagine why the emperor found her beautiful and when she performed her Chinese opera in front of the emperor, why he fell for her again and forgave all her evil doings. There’s something about a live performance that images cannot replace. What I found through my view finder while capturing the movement were a lot more mesmerising. With that, I’ll end this article with the farewell dance by Lady Gao as well. Special thanks to my research and logistics assistant Qiying for your help! I’m just watching Yanxi now. I’m always behind the times! I actually liked Gao Guifei’s ending quite a lot. I’m predisposed to Giselle-ified exits. I spent a lot of time being mildly upset about her comparative beehive hair, but the actress is so lovely it didn’t *really* matter. I could wish you had the styling of her at some point in the drama, though! These photos are beautiful. My favorite Giselle-ified exit, next to Giselle, is actually from a film called Pakeezah, starring the legendary Meena Kumari. Although, the Dance to the Death scene in Pakeezah is mostly another actress, since Meena Kumari was in declining health at the time it was filmed. For a sample of the glory of Meena Kumari and Lata Mangeshkar (who dubbed the character’s singing voice) in Pakeezah, I recommend searching Youtube for “Thare Rahiyo Pakeezah”. In this scene, Kumari is also in emerald green! wow, you taught me so much in one comment! I went to google “Giselle” and youtube “Thare Rahiyo Pakeezah”. I LOVE IT! AND YES! SAME SHADE OF GREEN TOO!! ❤ What are the chances!! !